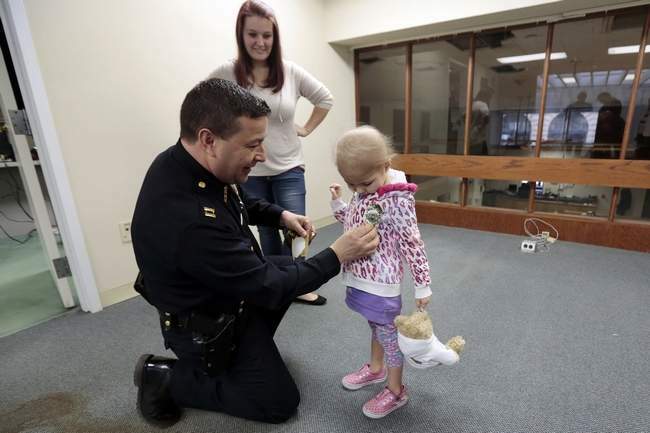 NEW BEDFORD — Seemingly without a care in the world, 4-year-old Haylie Jansen lay on the floor in the captain’s office at the downtown police station Tuesday, neatly coloring a drawing and carefully staying within the lines. Standing above her, Police Capt. Joseph Cordeiro talked with her mother, Jessica Jansen of New Bedford, about how peaceful and content Haylie looked as she picked up different crayons to add color to her drawing. “She’s a special little girl, that’s for sure. She has the courage of a lion,” Cordeiro said. Haylie was diagnosed in January with leukemia and is on a two-year treatment program that calls for near-weekly trips to the Dana Farber Cancer Institute for chemotherapy, according to her mother. On Tuesday, the family’s burden got a little lighter with a $5,000 check to help with their living expenses from the organization Cops for Kids with Cancer. Faherty said he will be visiting families in Providence Wednesday and Holbrook (two children who have eye cancer) on Thursday with checks to help their families. Cops for Kids with Cancer (www.copsforkidswithcancer.org), through the help of fundraisers across the state, raises money for families who have a child under 21 with cancer, according to Faherty. The Jansens are the fifth New Bedford family to be helped by the organization, Cordeiro said. Jessica Jansen said the money is a godsend for her, Haylie and her 3-year-old daughter, explaining it will allow her to continue to stay home, attend to Haylie’s needs and still pay for food, rent and other living expenses. “It’s incredible. That’s a big chunk to give to one family so it will definitely help,” she said. Jessica has definitely seen the best and the worst of humanity. In January, two donation jars to help the family with their expenses were stolen from Mark’s Beverage in New Bedford and Sunrise Bakery in Dartmouth. One of the two suspects in the larcenies has been apprehended and at last report the second suspect remains at-large. A GoFundMe account was started for Jessica and her family, and as of Tuesday, 280 donors had contributed $20,165 in three months. Jessica said the kindness people have shown her and her family “outshines” the bad acts she has seen.